I recently purged heaps-o-clothes from my closet. I had clothes from when I was in grade school, but I didn't want to part with them. I hardly had any room to live in my room, I had so many clothes. So I packed them up in bags and donated them. But jeans...that's another story. I hate to part with jeans that I like and ones that fit well! But I felt that with my new room makeover, I need to makeover some jeans too! 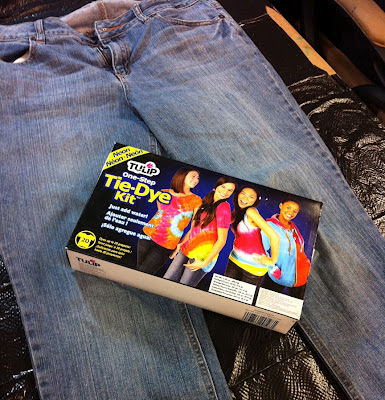 So I did something fun and dyed a boring pair with teal and fuchsia tie-dye! 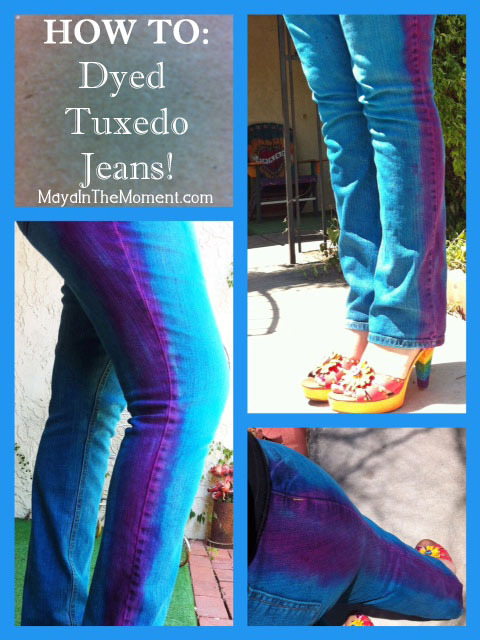 My finished jeans! The teal really gives them new life! 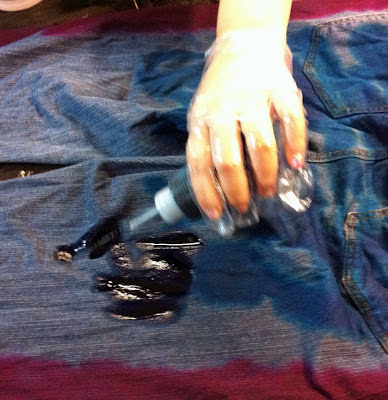 STEP ONE: Dampen the jeans. 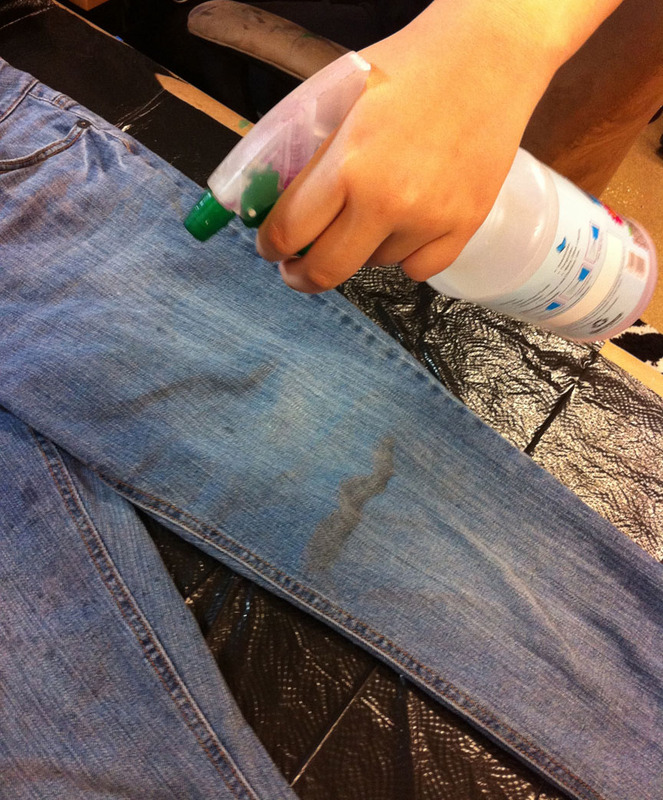 You can put them through the wash and take them out while they are damp, or you can use a spray bottle with water. Because denim is so thick, you really need to make sure they are wet so the dye will soak in and spread evenly. STEP TWO: Mix the fuchsia bottle - just add water and shake. 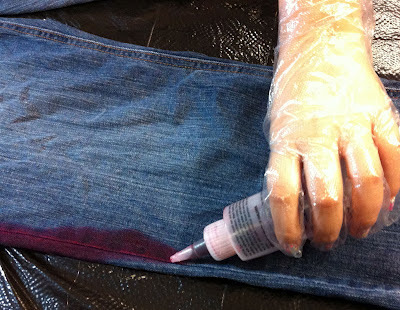 Draw a thick line down the sides of the jeans. Flip them over and do the other side too. Just along the outside of the leg. STEP THREE: Now mix and add the teal. You'll need tow bottles for this, one for the front and one for the back. Inside the kit there is an extra packet of teal dye. Make sure the pants are wet and then after you add the dye, rubs your hands up and down the pant legs to make sure the dye is evenly coated all over the denim. Flip the pants over and do the same. 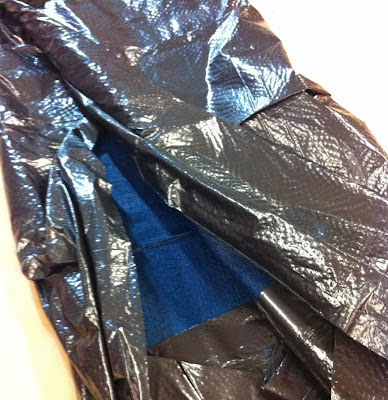 STEP FOUR: Wrap them up in the plastic bag, and let them sit overnight or for six hours. Wash in the machine in cold water and dry as usual! Hey have you checked out the new show called Craft Wars on TLC? Cute idea. Those shoes are fierce.